Continuing my updates. Not much to update here, but I should note I've decided since writing this that in each of these events, the main character travels from the TVCU to the Mirror Universe, and replaces his counterpart in that world...if he or she has a counterpart in that world. This post now incorporates information from the Horror Crossover Encyclopedia, published by 18thWall Productions. For the purposes of this post, Horror Universe and Television Crossover Universe are synonymous. This blog is a little different (and out of season.) In the TVCU, there have been many occurrences where people have wished they had never been born, and granted the wish of seeing what that would be like. These are those stories. 19th Century--ZORRO--"It's a Wonderful Zorro"--A late friend shows Diego, at Christmas, why he should stay Zorro by showing what life would've been like without him. 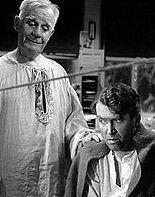 December 1946--IT'S A WONDERFUL LIFE--After George Bailey attempts to end his life, angel Clarence shows him an alternate reality where he never existed, thus showing him it's a wonderful life. December 1958--QUANTUM LEAP--"Conundrum"--Time traveler Sam Beckett leaps into the body of a cab driver. He meets meets an angel, who is there to show Sam an alternate life. Incidentally, he also meets Donald Trump, giving him the idea for the Trump Tower. December 1977--IT HAPPENED ONE CHRISTMAS--Mary Bailey Hatch has a similar experience to that of her father. Note that Cloris Leachman plays Clara Oddbody, the angel here, who is meant to be a relation of Clarence (daughter?). The actress here will be important further down the timeline. December 1978--MORK & MINDY--"It's a Wonderful Ork"--After Mork, an alien living with human Mindy, ruins a dinner party, he thinks things would have been better had he never arrived on Earth, but his leader Orson shows him what life would have been like for Mindy without him, and he realizes things aren't that bad. Late 1970s--THAT 70S SHOW--"It's a Wonderful Life"--Eric is absolutely devastated over his and Donna's break-up, and spends all day in bed wishing they never had kissed. But asleep an angel comes to show Eric, how his and the gang's lives had turned if he and Donna had never been together. December 1982--STUCK ON YOU!--The opening depicts the Earth spinning among the stars while Heavenly voices discuss sending an angel to help a couple in trouble. December 1987--THE FACTS OF LIFE--"It's a Wonderful Christmas"--Beverly Ann feels unwanted at Christmas and wonders what it would be like if she had never come to Peekskill. December 1989--CHARLES IN CHARGE--"It's a Blunderfull Life"--Charles is a nanny who is suffering from financial problems and realizes with his insurance he's worth more dead than alive. But after a flash of vision shows him what life would be like without him, he feels better about things. December 1989--MARRIED WITH CHILDREN--"It's a Bundyful Life"--An angel takes the form of Sam Kinison to show life without Al Bundy, and life is great for everyone he knows. In the end, he chooses to live because he doesn't want them to be happy. December 1990--CLARENCE--The Angel who first came up with the winning formula goes off on another helpful mission. December 1990--NIGHT COURT--"Hey, Harry, F'Crying Out Loud--It's a Wonderful Life...Sorta"--Harry is feeling down, but an angel takes the form of Mel Torme to visit him and restore his hope by showing him a world without him. December 1990--DALLAS--"Conundrum"--J.R. Ewing is suicidal and shown by a guardian angel (or is it a demon?) what life would be life without him. In the end, J.R. shoots a mirror, not himself, even though it appears as if he shot himself, but he didn't. December 1991--BEETLEJUICE--"It's a Wonderful Afterlife"--Beetlejuice gets depressed one day when none of his friends fall for his pranks. Believing that they'd be better off without him, Beetlejuice wishes that none of his friends had ever met him. After a strange man grants his wish and Beetlejuice sees how different things are without him, will he realize what an important role he plays in the lives of his friends? December 1993--FRESH PRINCE OF BEL-AIR--"The Alma Matter"--An angel takes the form of Tom Jones to guide Carlton Banks when he feels that his life isn't worth a damn. December 1993--RUGRATS--"Chuckie's Wonderful Life"--Much of the episode Chuckie's Wonderful Life references the film, Angelica convincing Chuckie the world would be better off without him, Chuckie's guardian angel showing Chuckie what the world would be like if he was never born, and Chuckie upon realizing he exists again saying hello to familiar things. 1994--PULP FICTION--The path of Mia's house after the dance sequence looks exactly like the path in this film; the characters come back singing. December 1995--RENEGADE--"The Road Not Taken"--Another "What if I wasn't born?" story with an angel showing what would have happened. December 1996--ELMO SAVES CHRISTMAS--Elmo has the same experience. Interestingly, in the alternate reality where Elmo doesn't exist, Bert and Ernie are cab drivers. The two cab drivers in George Bailey's home town were also named Bert and Ernie. December 1997--SPACE GHOST: COAST TO COAST--"Zorak"--Raymond shows Zorak what life would've been like if he'd never been born. December 1998--BUFFY THE VAMPIRE SLAYER--"The Wish"--OK, not really connected, but a similar theme. Anyaka, a wish demon, comes to Sunnydale, where she grants Cordelia Chase's wish the Buffy Summers had never come to Sunnydale. The alternate reality created is probably the same reality seen in all these other entries, and it's possibly the mirror universe. The Story: Springfield Elementary is bought by a private toy company. Notes: According the narrator, Moe almost kills himself, but changes his mind after being shown what life would be like if he had never been born. December 1999--JOHNNY BRAVO--"Johnny's Guardian Angel"--The segment "Johnny's Guardian Angel" is a spoof of this movie. December 2000--POPULAR--"The Consequences of Falling"--Harrison is a cancer patient who tries to commit suicide, but in usual fashion, Clarence comes down to stop him. December 2002--IT'S A VERY MERRY MUPPET CHRISTMAS MOVIE--Kermit loses the theater, and his friends rally to help. Kermit is having an "IT'S A WONDERFUL LIFE" moment where he travels to that alternate universe where he didn't create the Muppet Show. On his way back to the TVCU, he briefly is pulled to the Dagoba system, a long time ago, in a galaxy far, far away, where he meets Yoda, before finally getting home. (Thanks to Crazy Ivan for clarifying this for me.) The cast of Scrubs also appear in character, and also as the actors playing the characters. 2003--PARTY MONSTER--Angel says "I got my wings!" May 2005--THE FAIRLY ODDPARENTS--"It's a Wishful Life"--The entire 1st segment is a spoof of this movie with Timmy wishing he'd never been born then being shown how much better people's lives are without him by a fairy. December 2005--SMALLVILLE--Lex Luthor, in the hospital, is visited by his late mother, who shows him life if he hadn't been corrupted by his father. Sadly, this only makes Lex want to be badder. December 2010--WIZARDS OF WAVERLY PLACE--"Dancing with Angels"--When Tina becomes a full guardian angel, Rosie rings a bell and Tina gets her wings. December 2011--WAREHOUSE 13--Peter Lattimer touches an object once belonging to Philip Van Doren Stern, the author of THE GREATEST GIFT, the story that was the basis of IT'S A WONDERFUL LIFE. This transports Peter to the Mirror Universe, the world where Peter hadn't been born. This implies that THE GREATEST GIFT really happened, though perhaps under slightly different circumstances. 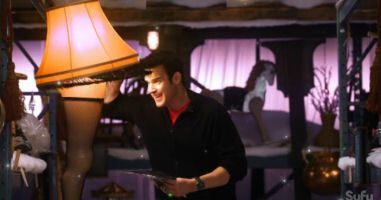 Also of note in this episode is the appearance of the "leg" lamp from A CHRISTMAS STORY, pulling one of my favorite holiday classics into the TVCU. TVCU-1-Cartoon Universe (also has its own inner multiverse, as seen in various cartons. These are mostly one time seen worlds). George Bailey of this reality appears on ANIMANIACS. George Bailey also appears on the SIMPSONS. Though the Simpsons coexists in the Looniverse and TVCU, this can't be the TVCU Bailey so must be his Looniverse counterpart. TVCU2--Events of THE LAST TEMPTATION OF CLARANCE ODBODY. In this divergent timeline, Clarence did not save George, who drowned after jumping. 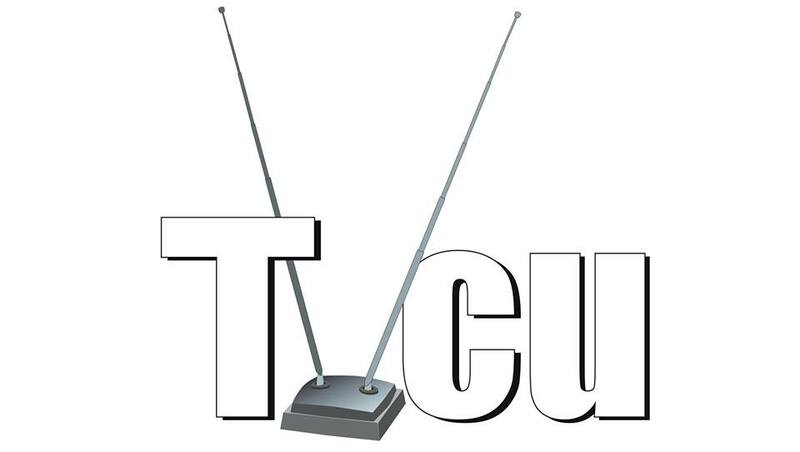 TVCU-3-Mirror Universe to the TVCU: This is the reality where the Federation didn't happen, but instead an empire was formed. In the 24th century, many non-human races formed an alliance. But wait, there's more. George Bailey was never born in this universe. Buffy Summers went to Cleveland after Los Angeles rather than straight to Sunnydale. Instead of a Justice League, there is a Crime Syndicate. Lex Luthor is a hero. Cobra temporarily conquered America. Basically any alternate version of TVCU events where the world went wrong instead of right occurs here. This universe factored heavily also in the last few seasons of Charmed, and it's appeared many times, such in any "world where I wasn't born or made the wrong choice" type realities. Even that Friends episode where Chandler was Joey's personal assistant, Ross never got divorced, Phoebe was a businesswoman, Rachel married the dentist, and Monica was still fat. 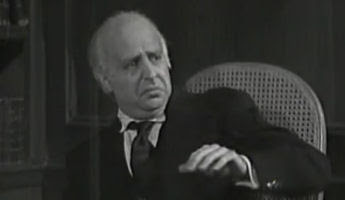 TVCU-29-Skitlandia and non-canon commercials--George Bailey of this reality appears on SHORT ATTENTION SPAN THEATER, ESCAPE FROM IT'S A WONDERFUL LIFE, and SATURDAY NIGHT LIVE. TVCU-47-Mr. Sweet's Broadway musical universe: Kathy Lee Gifford will star in a musical version of It's a Wonderful Life. I know there are many more, but I couldn't find them to make detailed entries on them.